The time to help your employees get engaged in their health is now. Statistics show that companies are investing heavily in workforce health initiatives. The appeal is obvious–companies that execute these programs successfully will realize reduced healthcare costs, increased employee productivity, improved employee retention, and higher employee satisfaction and morale. Yet implementing an employee health and wellness program is only the first step. Launching a program doesn’t guarantee positive results. You may face challenges, like lack of employee awareness and engagement, which negatively impact the outcome. 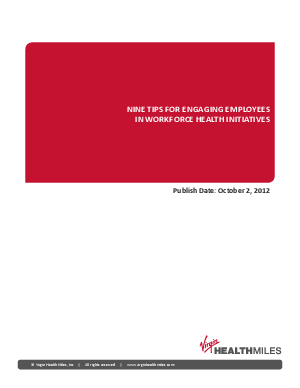 View this new report, Nine Tips for Engaging Employees in Workforce Health Initiatives, to discover techniques you can use to engage your employees in your workforce health initiatives. Used together, these methods will ensure that these initiatives drive results for both your organization and your employees.